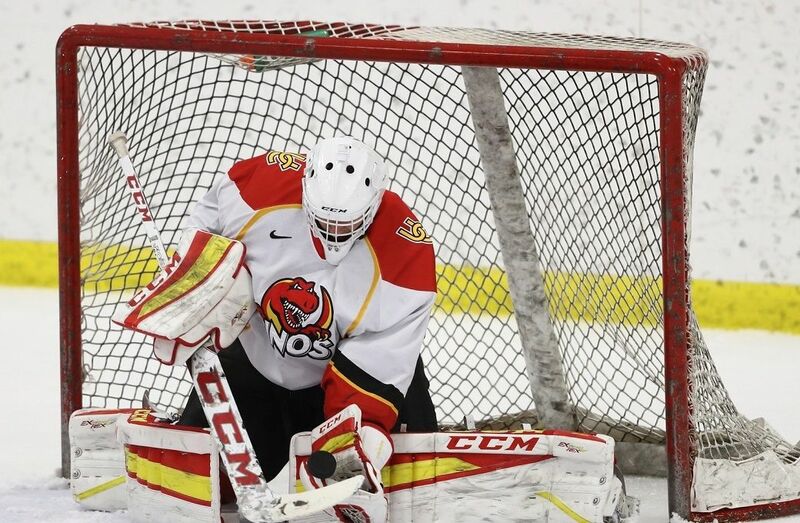 Aaron Armstrong admits he was concerned about his ability to play U SPORTS men's hockey. The Ryerson Rams centre is the OUA scoring champion after racking up 28 points in his final 10 games, including a six-point performance in his team's regular-season finale on Feb. 9 against the Guelph Gryphons. Armstrong entered the game trailing Concordia's Anthony De Luca by one point, but left Guelph with a comfortable cushion. He opened and closed the scoring in Ryerson's 11-4 romp, and sandwiched four assists in between his goals. He finished the season with 17 goals and 29 assists for 46 points, which ranks second in the nation and also happens to be a new Ryerson single-season record. De Luca had 43 points, including a conference-leading 24 goals. "I came into this season just hoping to get a shot on this hockey club," Armstrong said. "The coaches believed in me, and I can't tell you how much the players have supported me and encouraged me. "I just feel privileged to be part of such a great team." Armstrong followed an unusual path to the OUA and U SPORTS. He played most of his teenaged hockey in Junior C with the Wingham Ironmen, based near his hometown of Teeswater, Ont. He was a three-time league most valuable player, winning two scoring titles with Wingham, including a record-shattering season in 2012-13, when he racked up 124 points in only 35 games. From there he went to Saskatchewan's Briercrest College and a season in the Alberta Colleges Athletic Conference (ACAC), where he was the top rookie and named to the All-Conference team. Armstrong was then recruited to join the Rams last season by head scout Doug Hollinsky and athletics admissions liaison Brian Shantz. Coaches Graham Wise and Johnny Duco decided to give him a chance, even though it wasn't clear how the five-foot-nine Armstrong would match up with teammates and opponents who had played in the CHL and NCAA and, in many cases, minor pro. Would he be in over his head? "I had a lot of doubt coming in. I came in, honestly, just trying to make the team," said Armstrong, who managed five goals and 14 points last season as a Rams rookie. "But Johnny and Graham Wise, they believed in me enough to give me a shot. "This year, Johnny and his staff were gracious enough to give me another shot, and I really owe it to them for believing in me." "There's always that doubt," Duco said of whether or not Armstrong could make it at the U SPORTS level. "You tend to lean toward the major junior guys, or the top-end Junior A guys. But Doug Hollinsky, he had watched (Armstrong) a lot. And Brian Shantz also had a good connection with him. "They highly recommended him, and we took their word for it, and we're reaping the benefits of that." Armstrong is small, but he's fast, and he's an excellent puck-handler and playmaker. 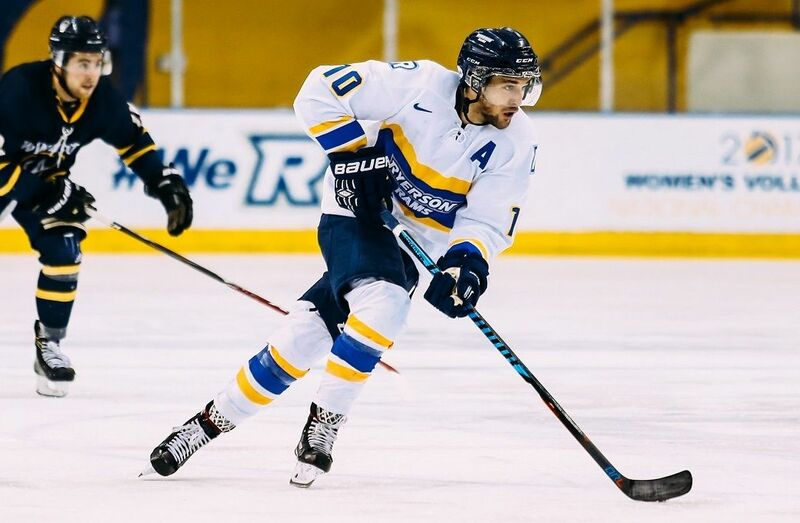 He fits right in with the high-octane style that the Rams want to play, and it has paid off as Ryerson led the OUA in goals this season by a wide margin, and ranked second only to UNB in the country. He wears an A on his jersey to signify the leadership role he has quickly taken on with the Rams. Armstrong is involved with the community and excels in his business management studies, having been named an Academic All-Canadian last season. "He's a big-game player. It seems like any time we need a big goal, or a good penalty kill, he's able to play in all situations," Duco said. "He's been a great leader for us, and we're really fortunate to have him." "He had not the best first year, but he was solid for us, and I think everybody knew coming into this year that he would get more comfortable," said Rams captain Michael Fine. "Now there's no looking back. He's been huge for us. "You ask anybody about 'Army,' he's a stand-up guy and a team-first player." Armstrong modestly credits his teammates with the success he's enjoyed. "Michael Fine has been so encouraging to me all year. He's believed in me more than I have in myself," he said. "And I'm playing with some good players. They make great passes and they make great shots. It's more than me out there. It's a whole group of guys working together to put the puck in the net and win hockey games." The Rams have won a lot of hockey games – 22 this season to be exact – shattering the previous program record of 17. The Rams won more games than any other team in the OUA, and had the second-best record in U SPORTS men's hockey. That's old news to them, though. The players are focused on what's ahead in the playoffs, starting Wednesday night at home in a best-of-three series against the Waterloo Warriors. "We just want to bring a championship to Ryerson," Armstrong said. "That's our goal." Armstrong wasn't the only Ram on fire as the regular season wrapped up. Daniel Clairmont also finished with a 10-game point streak, registering 21 points over that stretch. And Michael Fine scored two goals against Guelph to take over top spot on the Ryerson career scoring list. He finished with 132 points, surpassing Ian Richardson, who played for the Rams from 1992 to 1997. Fine said he knew before the game that he was one point away from tying Richardson. "It wasn't something that I wanted to think too much about, or put added pressure on myself," he said. "I just wanted to go out there and play my game, and whatever happened, happened. And I got the bounces and it went my way." "Mike's been a tremendous leader for us," Duco said of Fine, who's been the team's captain for the last three seasons. "It'll be sad to see him go, but he's definitely leaving his mark."